Here Is An Absolutely Stunning 1965 Mustang Shelby GT350 Hertz Tribute! Done Right No Expense Spared Factory 289 V8 Restored To Factory Specs With A Factory Automatic Transmission Done In Stunning Raven Black With Hertz Gold Shelby Stripes. 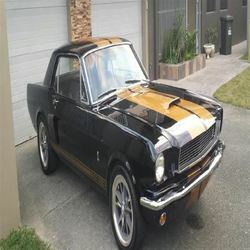 Along With Gorgeous Black Pony Interior With Shelby Steering Wheel, and will accommodate 4 people comfortably. This truly is a gorgeous 4 seater. This Beautiful Car was purchased just over 2 years ago from a family who restored it with Extreme Attention To Detail. It was Garaged and Kept In California And Since Restore, It was stored by the previous owners In A Climate Controlled Facility Which Is Why It's a great looking Stallion. The Car Was Professionally Painted With A High Quality 3 Stage Paint Job, Done With PPG Brand Paint For The Body And Stripes Which Makes For A Wet Looking Gloss Finish No Bondo Was Needed On This Stallion Because It Has Never Seen An Accident Or Fender Bender. The Engine Bay Shows No Crinkles Ripples Or Damage, Nice And Straight, All Doors, Hood, Trunk And Fenders Line Up Laser Straight . The Doors Hood & Trunk Open And Close With Ease. All New Rubbers And Glass. This Baby Is Turn Key Ready To Hit The Streets!! With It's 289 V8 Engine And Sleek 17" Diamond Cut Shelby Wheels & 4 Brand New Z Rated Tires, Along With Perfect Working Power Steering And Brakes That Stops This Stallion In A Nice Straight Line. All The Electrical Is In Great Working Condition. Don't Let This Stunning Pony Pass You By!! I Encourage You To Come Down And Look At The Vehicle Or Send An Inspector. You Will Not Be Disappointed! This Is A Rust Free Great Running And Driving. This Unique Ford Mustang is eye catching. Only travelled 58757 km.